I've been posting what feels like way too much about BizTalk and client certificates lately, but I've come to realize, it's most of what I've been consumed with lately. Here's a note on how I've finally managed to refine the process of getting client certificates into the store in the correct place and how to get BizTalk reading them in its ports. The process is quite simple, it was all the hiccups I encountered that really slowed me down. after entering the password, you are presented with the usual MMC console ready for the certificates Snap-In to be added. When you highlight Certificates and click Add, there is no dialog to choose what you'd like to add the snap-in for like there usually is, it just automatically adds the Current User. Once this opens up, it's as simple as importing your Client Certificate to the Personal store. After this, take a look at the certificate's certification path. Once you know the path, make sure the Root CA (top of the path) is in the Trusted Root Certification Authorities and any intermediate authorities (the ones below the Root CA) are in the Intermediate Certification Authorities. In the ideal situation, you should now be able to go on to using the Client Certificate in your BizTalk application send ports. To see how to set up a Send Port for using client certificates, see my post where it's outlined here in detail. So, the most critical step to getting Client Certificates into a usable state for BizTalk is most definitely importing the certificates and trusted roots into the store that BizTalk can read and use. This simple act is what gave me the most trouble and run around on my dev box. To me that looks pretty wide open, but I'm no domain admin (feel free to tweet me, with advice). None of the changes helped avoid the 740: The requested operation requires elevation. error, even after logging off/on, etc. 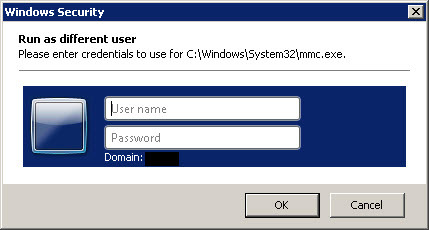 So, I followed the instructions and entered an administrator password and MMC opened. I added the "Current User" certificates snap-in, same as above. The first thing I noticed however, was that the certs all looked the same as when just open MMC as admin...fishy. Regardless and went on adding my client certificates as outlined above, thinking it was for the service account...wrong! BizTalk could not find the certificate despite it "being there". Cannot find the X.509 certificate using the following search criteria: StoreName 'My', StoreLocation 'LocalMachine', FindType 'FindByThumbprint', FindValue '99 a2 fd 91 db 1e 91 c5 86 4e 4c bf 8a df 8c 66 60 e2 56 9c'. So, I hit up Google and everything came down to the same solution, you have to add the client cert to the service account's Current User store, which I thought I already had. I tried adding and re-adding and trying to hit different stores to no avail. Finally I decided to just spin up a new VM and try the same steps as above. I went straight to the command-line route and it worked immediately. 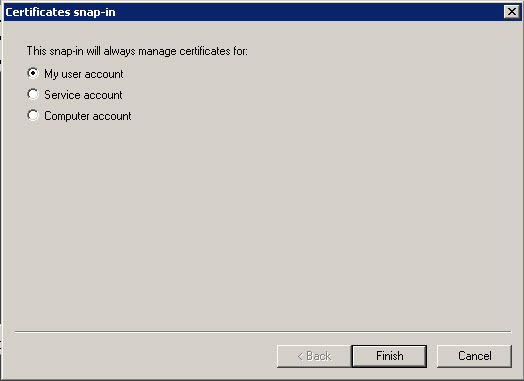 I added the certificates snap-in and immediately noticed a difference: there was no dialog to choose My user account, Service account or Computer account like there was when I ran it with Shift-Right-Click --> Run as Different user on my initial dev box. It just automatically added the Current User like in my instructions above. This prompted me to go back and try again. This time I did the command-line and it still gave me the 740 error. 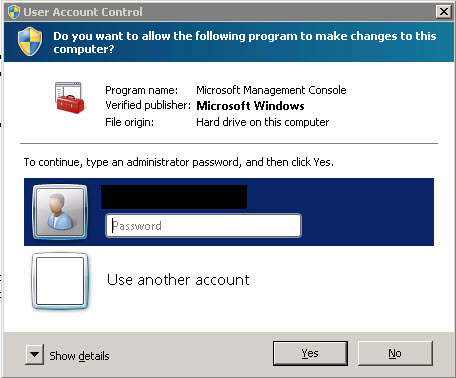 So I tried the Shift-Right-Click --> Run as Different user route but this time instead of entering the administrator password for the 2nd time I chose the User another account option and RE-ENTERED the service account information. MMC opened! 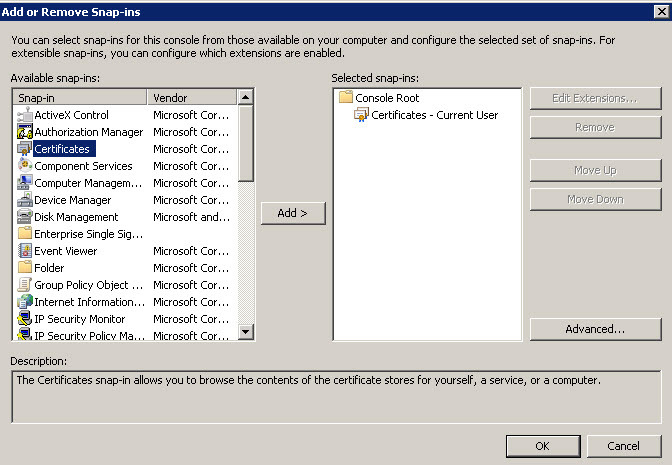 This time when I added the snap-in for certificates, it only added the Current User automatically, I imported the Client Certificate, tried BizTalk again and Hallelujah it all worked! Don't trust anything in Windows :) This was Server 2008 R2, apparently older versions don't have this problem, since there was no User Account Control. Please feel free to tweet @ me with any questions, critiques or comments.